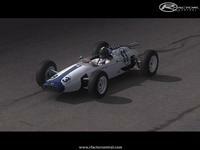 A free downloadable add-on car pack, based on old Formula One 60s cars. 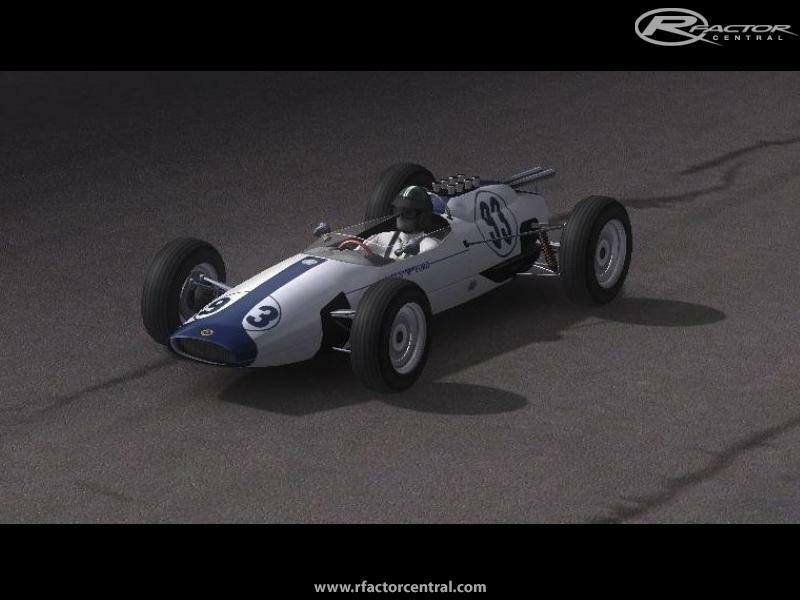 F1 1964 Cooper T73 is originally a scratch made add-on for GT Legends and GTR2 by BorekS, converted and enhanced for rFactor by GFraser1965 & team. 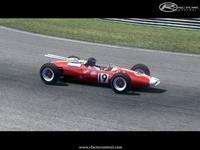 Although it is a single car add-on, the mod pack also includes a few non Cooper manufacturer related skins in different racing team colors (Ferrari, BRM etc. 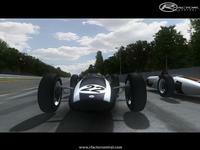 ), we call it "car mock-ups". To fake better the full F1 1964 race grid feeling, such team cars use slightly different body parts (engine pipes, wheels) etc. 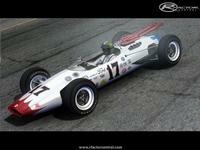 ), but all these cars use same physics and sounds like the original Cooper T73 car. 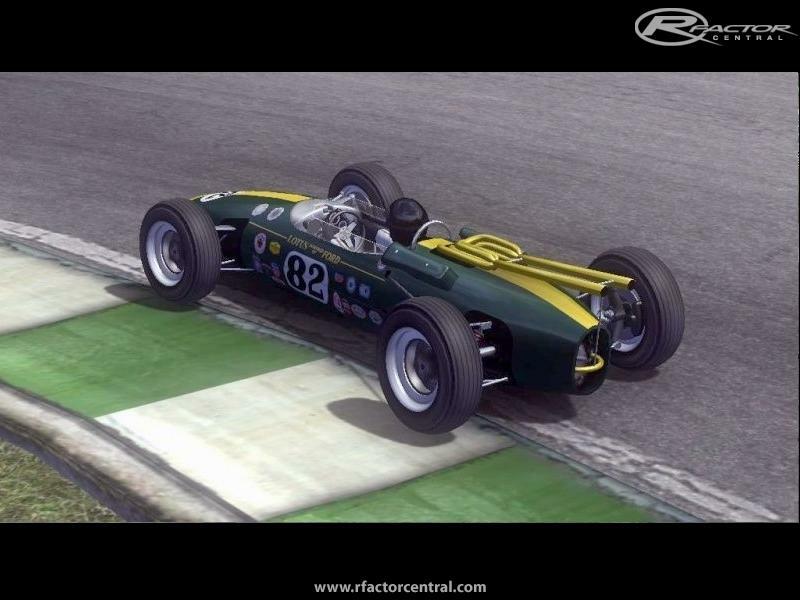 The rFactor mod version got a few early 60's Indy racer car mock-ups aswell, based on Lotus 29 and Lotus 38. Aside a lot of newly made extra skins for the rFactor leaque racing there is a brand new driver head mesh made, comparing to current GTL/GTR2 mod relase. The only thing I noticed is that the cars don't accept damage very well. I can't remember how many detachable parts (listed as debris in the .gen file) but more could be added. You would need to separate some parts into separate .gmt files and then list them as debris in the .gen file. Along with this you could lower the amount of the hit needed to make the part detach. Wheels breaking off are a problem in rFactor as you normally can't then drive back to the pits and get repaired, so your race is typically over. In iRacing they have a "quick tow" which has a tow truck quickly pickup your car and brings it back to the pits. The wet skid marks do not match the tires. hi, Ive asked GFraser1965 about this. well, the skid marks are generated by a track file. Usually this file (typically called something like wetskid.tga) is located in the commonmaps.mas file. Some track makers use custom skid marks which will be located either in a .mas file, or loose in the track folder. So the skid marks can't be changed using a car file. One final thing, The wet skid marks do not match the tires. and is completely off of reality. Rear marks are about 1.5 ft wide and the tire is much smaller. The front skid marks are too small for the tire size. It is just a small streak of a mark. I figured I have to mention this as you are the only one Borek who can correct this. Thank you again for a wonderful Mod which I love so very much! The cars look great and also drive great! You can drive them into a wall and they do not break apart. Only at high speeds into a solid object will make the wheel break off. Is there any way you can update the damage profile to be any bit more realistic? It is the only thing this car is lacking to be a true contender. Otherwise Thank You for such an awesome Mod!!!!! This really helps complete the missing F1 years. 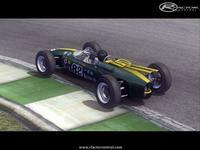 I run this car using All car challenge3 sharing with F165/66/67classic. guys this single car mod I had missed ... now I try !